What was the Antikythera? Was it really the first ancient computer? Who built it and for what purpose? In 1900, a Greek diver by the name of Elias Stadiatos was diving off the tiny land of Antikythera. To his amazement, he discovered the wreck of a Roman cargo ship. The items recovered from the wreck included fine furniture, pottery and wine from the first century B.C. But the most astonishing find of the wreckage lay hidden until 1902 when an archaeologist named Valerios Stais discovered from the wreckage a device that he could only guess the purpose of. This device is now known as the Antikythera mechanism. The Antikythera mechanism had been discovered after it remained in the seas for over 2000 years. As scientists began to study this device, they were able to come up with a reasonable conclusion to its purpose. What scientists had found was the world’s oldest geared mechanism. Enclosed in a wooden box, the antikythera mechanism had dials on the outside enclosed in a complex system of bronze gear wheels. Doors, in order to protect the dials, were hinged to the box. There were over 2000 inscriptions in Greek, describing the construction and function of the device. X-rays indicate that at least 30 different gears are present in it. What could have the been the purpose of such a complex device? 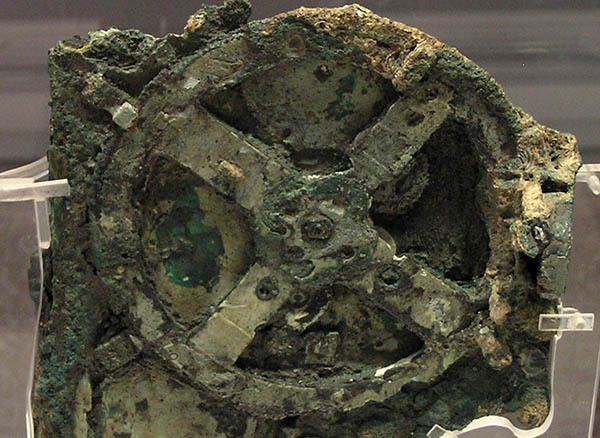 It is well accepted amongst scientists today that the antikythera mechanism was a mechanical analog computer used to calculate the movements of the heavenly bodies (stars and planets). The mechanism is thought to be the first analog computer built by man. Discovery of the antikythera mechanism was made off of Greece. However, the device was on board a Roman ship. So who actually built the device? It is thought that the anitkythera mechanism was built by the Greeks in 87 B.C. and lost around 76 B.C. But the question as to why it was on a Roman ship remains unanswered. Several theories have been put forward but one theory suggests that the Roman emperor Julius Caesar had taken the prized possession from the Greeks, amongst other things, as spoils of war. Nevertheless, the vessel was doomed to ill-fate from the moment it set course to sail. There were several mentions by Roman as well as Greek thinkers of the day of such devices. The great orator Cicero, in the first century B.C., wrote of such a device being constructed which produced the motions of the sun and the planets. Archimedes is known to have had two such devices in his planetarium, which were rescued from Syracuse when it fell in 212 B.C. So it seems that such devices were a part of Greek tradition and were used by the great thinkers of the day. However, it still remains a mystery whether only a few of them were produced or were such devices more common in the ancient world. At the Museum of History and Science is a 13th-century Islamic calendar with gears and dials showing the various cycles of the moon and the sun. Al-Biruni, the famous Islamic astronomer, wrote a manuscipt in 1000 A.D. with a similar arrangement of gears of such instruments that were much simpler than the Antikythera mechanism. It was around this time that Islam was acquiring ancient Greek knowledge and rediscovering ancient Greek texts. This indicates that the knowledge of such technology which is now lost to us was known to others in the ancient world. At present, the Antikythera mechanism is being studied through a joint program between Cardiff University, Hewlett Packard, the National Archaeological Museum in Paris and many others.. The joint research project is known as the Antikythera Mechanism Research Project. Further fragments of the device are continually being recovered and studied to unlock the secrets of such a technological marvel. Currently, the Antikythera mechanism and a reconstruction reside at the National Archaeological Museum in Athens. A reconstructed model also exists at the American Computer Museum in Montana.